Did you know 2012 had whopping 14 Super-Hit films and 10 Hits? 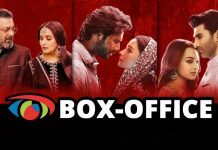 Well, for more such interesting Box Office insights, catch box office business of all films which released in 2012 right here! Both house full 2 and rowdy rathore have been budgeted in the range of 65-75 crores. Thus their profit multiple cannot be more than 150% at the given box office earnings. Both movies should be classified as hits instead! Student of the year budget 60cr box office 68cr. .thn how come it b SUPER HIT??? Student of the year budget was 60cr thn how its a hit? ?